I've been nominated for the Liebster award yey, by the very Lovely Dalisse over on The Tiny Canary . Which I was absolutely thrilled about when I saw her message pop up on Instagram. I have been following Dalisse for a little while on Instagram and i'm forever going heart eyes for the outfits she posts, especially her pastel creepers, note to self must attain a pair for my very own! 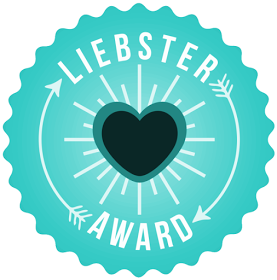 The Liebster award is nominated by other fellow bloggers to get a little shout of appreciation and to help them get noticed and boost their blog to others. Such a wicked and thoughtful idea. 11 Random Facts about me. 1) I am totally petrified by the dark, if i'm ever home alone which is almost never thank God, every single light in the house will be switched on illuminating my street. 2) I love Quentin Tarantino, not just his films the movie wizard, which are all by the way my favourite films all at once. I love him and would literally die if I ever got to meet him. Quinny come say hey some time. 3) I hate Starwars DULLLLLLL city. 4) My fluffy faced Cat Cassandra is my best friend. No seriously Cassie just gets it. 5) I go mad for anything Japanese, mostly street fashion, Anime and all the kawaii I can handle. You either get it or you don't and I can't get enough. 6) My mum moved to New Zealand nearly 2 years ago, it's hard and I miss her every single day but i'm glad she's happy. 7) I travelled the whole wide world when I was 19. I have had some of the most amazing experiences before my 20th birthday, then most people in their lifetime. Swimming across the great barrier reef, experiencing the Grand Canon and hiking along the Great Wall Of China to name a few. 8) I collect Alice In Wonderland books, the older the better. My most favourite copy is one I picked up in a New Zealand charity shop for $4. 9) Harry Potter is a way of life, and has been since I was around 5/6. Slytherin's where you at? 10) I like to collect cameras. I think i'm just a hoarder at heart really, super old ones that still use film can have wicked effects on pictures. I love the anticipation of waiting for your photos to be developed. 11) I go goo-goo eyed over foxes. Those bushy orange tails just make me want to squish them all with love. Honestly, I was sick of seeing the same Topshop haul, I know I know i'm guilty of bashing Topshop and buying from there but after seeing every girl in Topshops ''New Arrivals'' I may as well be looking at the site. I wanted to have a go myself, I've always loved clothes and showing outfits I put together, not so much fashion i've never really followed it only loosely in some parts. I'm a strong believer in outfits should be fun and not wearing the ''must have'' this season. I'm mean it's totally cool if you like to follow it, I prefer to mix it up I guess? 2. Who is your favorite style icon? Hayley Williams. That woman is goals and a huge inspiration for life in general. She knows how to have fun with an outfit and brush off what critics say. Props to you Hay-dawg. 3. Can you name two of your favorite bloggers and explain why they are your favourites? The very lovely Aoife RocketteQueen. I've only been following her a few months on social platforms but she is honestly so genuinely nice and great to talk to. AND she likes Pokemon and has wicked hair seriously how could you not love her? 4. What's the one wardrobe essential you can't live without? Hmmmm tough. I don't have one particular item of clothing but I do have a very loved collection of grim clothes. Like good gross so hilarious you can't not buy it. Collection consists of cat cardis, glittery tops and fluffy bags. Eclectic. All over the place and confused. I have no idea. 6. What is your greatest achievement outside of blogging? Being self dependent since I was 19. Running my own house, holding down a job i hated and left me in tears. But I did it. Don't get me wrong, my parents have bailed me out in the past but yeah I guess adulating is doable, just. I'm doing it, not well at times but I am. To Kill A Mocking Bird. Go read now. Seriously. Scout so sassy. 8. If you could travel anywhere in the world, where would you go? I've travelled a lot. I've been to some amazing places but i'd love to go back to Australia again and travel down the East Coast with James in a camper. And Japan, i'm going back In October which i've mentioned 3839037309 times already. I left my heart in Tokyo 6 years ago. Such a difficult question to ask. Literally no clue. I'd hope a well paid job, with a mortgage. I definitely see my future with James. Oh i'm old. 10. What was the first movie or book that made an impact on your life? Harry Potter is life, see fact 9. I am a big dreamer, you can't get dreamier life then HP. 11. What advice would you give someone who just started blogging? It's hard, but worth it. It's a great creative outlet and you make lovely blogger friends on hand for advice or just a good old chat on twitter. If you feel like giving up don't, you put in what you get and it will be so so worth it.